I wish I could say that I grew up eating tres leches cake when I lived in Colombia or even when I was a kid here in the US but I would be lying to you if I did. My family is not really big into baking and it seems like I was the only one who is crazy about it, so we never had it growing up. In fact, I didn’t actually get to eat it until I was in college and it was only because my mother gave me a leftover piece from a birthday party she had been invited to, and it was delicious! You will read in many food blogs or even recipe sites that tres leches cake originated in Mexico, others say it was creted in Costa Rica, others say South America, many in Colombia say it was born there even though they call it “torta genovesa” (Genoese cake), and they’re all right… and wrong. No one really knows where it came from even if they swear up and down that they do, but the reality is, no one can really say for sure. It does have a lot of Latin flavor though so I’ll give them that much. I guess the correct answer would be that it is considered a Latin American cake. How about that? The traditional way of baking it is by using a sheet cake pan, usually 9 x 13 inches (33 x 23 cm), so that it can catch all the extra liquid that the cake may not be able to absorb, plus it makes it much easier to bake. However, my favorite way of making it is by using a 9 x 2 inches (23 x 5 cm) round baking dish and then cut it in half to make it into a two tier cake, it not only looks better but you can also fill it with whipped cream and fruit if you want. The trick is to use less liquid or you’ll end up with a huge mess. In this recipe I decided to add a little bit of arequipe to the whipped cream to give it a richer flavor and the result is amazing! 1. Pre-heat oven to 350ºF (180ºC). 2. In a medium bowl mix flour, baking powder and salt. Set aside. 3. Whisk egg whites until frothy. Then, slowly add sugar while whisking at high speed until it thickens, approximately 3-4 minutes. 4. Add egg yolks one at a time while mixer is still running and mix at high speed for another 3-5 minutes until they’re blended thoroughly. 5. Add half of the flour mixture and keep mixing until it is well blended. Then, add the milk and the vanilla extract. Finally, add the remaining flour. Keep mixing for about 2-3 more minutes until everything is well blended. 6. Grease and flour a 9 x 2 inch (23 x 5 cm) round baking pan and pour in the batter. Tap a few times so the air bubbles rise to the top and bake for about 30-35 or until a knife inserted in the center comes out clean. Let the baked cake cool on a cooling rack. Meanwhile, prepare the whipping cream by mixing ½ cup (120 ml) whipping cream with the arequipe. Mix well. Put the remaining whipping cream in a mixing bowl that has been in the freezer for at lease 15 minutes. Mix at high speed until it foam forms. Add the arequipe mixture and keep mixing until it thickens, approx. 1-2 minutes. Then add the powdered sugar and the vanilla extract, keep mixing at high speed until soft peaks form (about 3-5 minutes). Refrigerate until ready to use. In a small container mix the heavy cream, evaporated milk and sweetened condensed milk. Mix well and set aside. 10.Once the cake has cooled, cut it in half with a cake leveler or knife to end up with two pieces. Poke one of the cake pieces with a fork and then pour half of the milk mixture, let the cake absorb it thoroughly. 11. Once the milk has been absorbed, cover the cake with some of the whipped cream and then place the strawberry slices on top. Then cover the strawberries with another layer of whipped cream. 12. Put the second cake piece on top of the strawberries, poke it with a fork and pour the rest of the milk mixture, let the cake absorb it. With the help of a spatula cover the top and sides of the cake with the whipped cream. 13. Put the remaining whipped cream inside a large pastry bag with the tip of your choice to decorate the top of the cake, as well as the lower edge. Finally put the strawberry halves on top of the cake. Refrigerate for at least an hour before serving. Hey I want to make this cake for a party. I was wondering how long I can refrigerate thid cake for without getting too dry? Hello Vanessa, you can make the cake days in advance and leave it wrapped at room temperature. But once you pour in the tres leches mixture and decorate it, you should leave it in the fridge for a few hours. The reason I say a few hours is because the whipped cream will start to lose its texture the longer you let it sit. Vanessa, baking times vary depending on the size of your baking pan. The bigger the baking pan, the longer it takes to be done. If it's smaller, then it takes less time. Keep your eye on it and do the toothpick test once it starts to turn a light golden brown. Hi I LOVE your video.. 🙂 But I have a question I have a 13x9x2 cake pan di I add more? if so how much? thanks! Thank you so much Sparkle! You can use the 9×13 inch pan with the amounts I have for the recipe, however it will take less time to bake, so keep an eye on it. Also, if you want to make with the filling, it may be tricky to cut the cake in half but it is doable. If you only want to do one layer and not add any filling I suggest you add more milk mixture, so use one large can of evaporated milk, which I think it's 12 oz., one large can of condensed milk which should be about 14 oz. and 1 cup of heavy cream. Otherwise, it will come out dry. Hello Diana, that looks amazing! Im Colombian too and it is great to see people like you representing our food in such an awesome way. THANK YOU!!! I want to bake this cake for my mother in law next weekend, Can i bake it on saturday taking into account the party is on Sunday? will it be good for the next day if I leave it in the fridge? Thank you! Hola Carito, thank you for your comment! It makes me so happy that you're enjoying the recipes I've been posting.Absolutely, if you want to make the cake a day before, you can; however, don't decorate it with the whipped cream because it will start to lose it's shape. What I like to do is bake the cake the day before and finish it the next day. Hi Alfonos, yes it's 1 tablespoon of baking powder because it's a spongecake and you need it to rise as much as possible so it can absorb the tres leches. If you think the cake is too sweet, you can lower the amount of sugar when you make it, we all have different tastes and I've never heard a complaint about it being too sweet. The same thing goes for the leches milk mix, it does come out sweet but it's subtle and not overwhelming. hello Diana, I just wanted to thank you for such an awesome recipe. I made it yesterday for my mother-in-law and everybody loved it. THANK YOU SO MUCH! Thank a lot for your response.. Appreciated. I did cover the cake when i kept in fridge. But as you told, the hardening could be because of limited addition of the milk mixture.I wanted this cake for a birthday , so i wanted it out the pan (for the occasion). But what i did is, after i have cut the cake into pieces i added more milk mixture to individual pieces before eating. It softened almost immediately. And thanks for sharing such a nice recipe, everyone who ate the cake loved it. This is the best tres leches cake I have ever had!! If I use your recipe (the cake part) with a 9×13 pan will it be thinner(not as tall)? Hi Diana I love this recipe! I am just wondering if it's ok to divide the cake into two cake pan? Hi Yaiza, yes, you can! I'm just used to using one cake pan and then cutting the cake in half because that's the way I was taught. Hi Diana, my dad had a birthday party on Saturday and I made your "Tres Leches" cake it was delicious everyone was so impressed with it. Thank you so much. Hi I have made this cake with your recipe and it is delicious thank you . I do have a question though my cake does not come out flat which makes it difficult to decorate. I'm very new at baking any suggestions? Is there another way to make it without the dulce de leche and also how long can it be out of the refrigerator? We are having a picnic that's why I ask? Also if can I just double the ingredients to make it bigger? Hi Brenda, adding the dulce de leche is completely optional and you can make the whipped cream with just powdered sugar and vanilla, if you want. 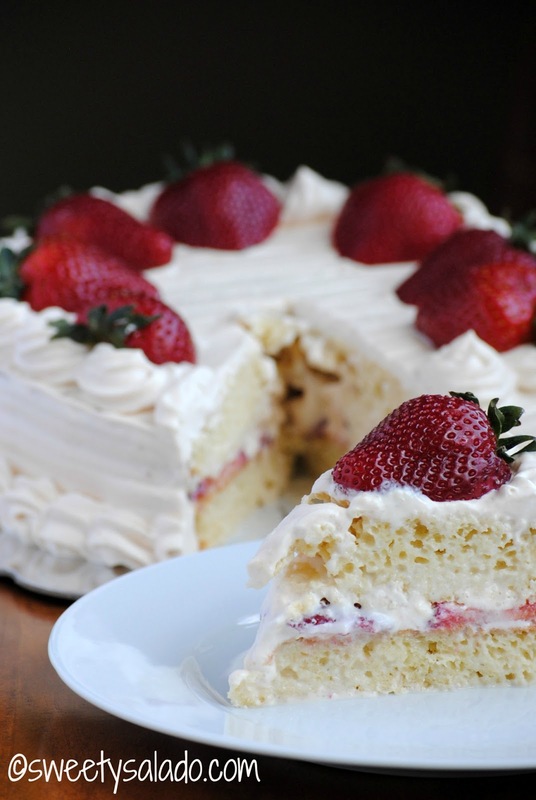 The whipped cream will start deflating and eventually melt if it's too warm, so if you're going to take it to a picnic I suggest you treat it as if it were an ice cream cake and keep it inside a cooler with ice to make sure it stays nice and cold. Hello! I've made this cake twice already and the taste is amazing. The only problem I'm coming across is the whipped topping is coming out a bit runny. I've made it once with the ariguipe and once with the dulce de Leche with the same results. Any suggestions on what I may be doing wrong? Thank you. Hi Crisina, thank you so much for making this recipe!!! The whipped cream could be runny because you probably haven't whipped it enough, you have to whip it until stiff peaks form, so if you take some whipped cream with your whisk and hold it with your hand, it should stay on it and not drip off. However, you have to be careful to not overwhip or it'll turn into butter.The other tip I can give you is to stabilize it to make it firmer. I still don't have the video on how to do it but it's pretty easy to do. Here's a great video that shows you how: https://www.youtube.com/watch?v=NDIR9LdgmbgHope that helps. Thank you so much Diane for posting the Tres leches recipe. I made this for my brother-law b-day and everyone loved it. Your instruction are very clear and easy to follow. I will definitely be doing this again. Thanks again. Omg thank you very much! I made it yesterday! I was going to let it sit till today for my husband's birthday but when he got home he found it and tore in it!!! And I found whipping cream and the woman at the store told me that 3/4 cup milk and 1/3 melted butter was the same as the heavy cream… but nice to know that half and half and heavy whipping cream can be used I bought them just in case but thank you very much!!! Hey I have a question can I use the whipp cream from store if you don't make your own? Thank you soooo much this turned out to be an amazing cake! My family loved it! At first by seeing the video I thought that the bread would come out dry and the whole thing just like many others I have tried before…But none of that It was simply amazing and btw I also made the Arequipe another great recipe, never imagined it that easy 🙂 THANK YOU. Hi, my name is Tatum. I'm only 11 and i'm a baking/cooking blogger, I made the Tres leches cake because someone requested it and it was so delicious! i am editing the video for it right now! If you want to check out my blog it is picklepopsickle.wordpress.com . Thanks so much for your inspiration! Hello Diana, I just want to thank you for the recipe! What do you think, is there another way to cover the cake with fondant one day before? Even though it's not a traditional way to decorate a tres leches cake, you can cover it with fondant, if you want, as long as you cover it with buttercream first. Hi Diana, I've made this cake a few times before and I love it but i cant find whipping cream in my supermarket anymore. what can i replace it with? heavy whipping cream? Hi jennyfer, heavy whipping cream works really well for making the whipped cream and the tres leches mixture. I actually like it better than regular whipping cream because it has more fat and it not only whips faster and better, but it's also more stable. Hello Diana,I love your Tres Leche cake recipe. I did have a question on the cake part of the recipe. I have made Tres Leche cake before using the 2 tier method and came out wonderful but for some reason lately, my cake once cooled starts to deflate and look awful. I'm not sure what I am doing wrong that the cake starts to shrink and loses its shape. Please advise. Hi there! That's actually the same thing that happened to me the first time I tried to make a round tres leches cake. After trial and error I discovered that the main culprit was the amount of tres leches that I was adding, which is the reason why this particular recipe has a lot less milk than a regular tres leches sheet cake. The measurement of the tres leches mixture is enough to make it moist and delicious but not to the point where it will drip out and flatten the cake. Hello Diana, I made this yesterday and my cake came out dense and heavy. Please advice. Hi there,When sponge cakes come out too dense and hard it's mainly because the flour overmixed. Try to mix until it's incorporated so you don't overdevelop the gluten in the flour, which is what makes the cake too dense. HelloI love this cake and every time I've made it people love it. I have a question, what can i do for the cake to not get so crunchy? I usually have to cut some of the top off. And how much of the ingredients do i need for two 9inch pans? Thank you for this delicious recipe. Hi Norma, thank you so much for making this recipe!! !If the cake comes out crunchy is because the oven is either too hot, which happens when it's not well calibrated or you left it in there for too long. What you can do is start checking if it's done before the 30 minutes, that way it won't be overcooked. 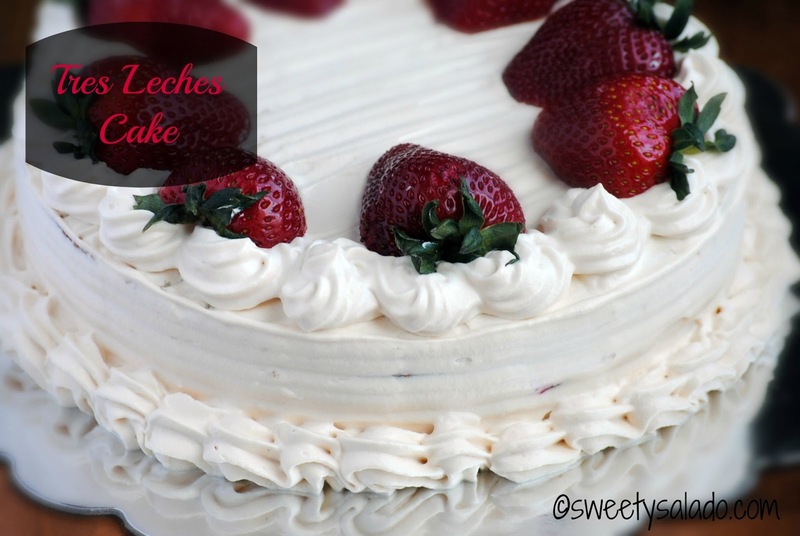 I love Tres Leches Cake, but had never made one myself. My daughter and granddaughters were visting, so I wanted to bake a special dessert. I scoured the internet and found your recipe. I am so glad I tried this. This is the best Tres Leches Cake I have ever eaten! It is not too sweet and not too wet; just perfect! Hello! I don't have Pam at my house. Should I just use butter to grease the pan or should I grease it with butter and then dust it with flour? Thanks for your recipe! I'm hoping to try it tomorrow! Thank you so much for this wonderful recipe. My cake turned out BEAUTIFUL and it was the best cake that I ever made. My family hates things that are too sweet and this was just perfect.If anyone is interested in how to stabilize the whipped cream topping, I melted a bunch of mini marshmallows (or use 3 jumbo ones) in the microwave and let them cool, then added that mixture to the whipped whipping cream. It keeps everything a little bit more firm, since I knew that temperatures might be warm in my area and I was worried about things melting and not staying in place.This was a wonderful recipe and I'm looking forward to discovering more on your blog. Thank you for sharing! Hi i want to make the tres leches cake for my mom viryhday but i has some questions i want to make a xake big enough for 15+ ppl so what size cake pan should as i use? & how much more should i add of ingredients. Hi….the comments on this recipe are so good that I want to try it but I have a question. In the recipe you have mention 1 tablespoon baking powder. Is it teaspoon or tablespoon? Hello Ameeta, it's actually 1 tablespoon. Since this is a spongecake, you need a lot of air in the cake so that it can easily absorb the three milks mixture. Hi Diana,If I double the recipe and bake it in a 9×13 rectangular pan, how long do I have to bake it for? Hi Maggie, you can also bake this batter in a 9×13 baking pan without having to double the recipe. I would only double the amount of ingredients if you wanted to make 2 sheets of cake in 2 9×13 baking pans. If you do make it in a 9×13, then make sure to start checking it after 20 minutes or so because it bakes faster than the 9 inch round pan. Hi, your recipe sounds and looks yummy and simple unlike other recipes so I wanna give it a try but I have a 10 inch round pan and I plan on cutting it in half and filling it like you. Should I double the recipe? I just don't want it to look super thin cause it's for a bday. Thank you!! Hi Yvanna, the 9 x 2 inch pan that I use for this recipe has a volume for 8 cups of liquid or batter. A 10 x 2 inch pan has a volume of 11 cups. So I think that if you multiply the amounts by half (½) your cake should come out great. Hi kawthar, this tres leches cake recipe is a bit different than your average tres leches cake because it needs less milk mixture in order to leave it outside the pan. If you add the regular amounts for a tres leches cake, you will end up with a huge puddle on your pan, which is the reason why most tres leches cakes are left inside the baking pan. If you cut the cake to peek inside, you will see that it is still moist but not dripping. If you want to add more liquid, you will not be able to keep it outside the pan. Hi! This has become a family favorite for the holidays! As a Colombian, anything with arequipe is a winner! This cake is just so delicious and not overpoweringly sweet that everyone loves it! And this is the second year in a row that it has been requested, thanks for the recipe! Feliz Navidad! Hello Patty, I usually do just that, make it the day before so the cake can absorb the milks overnight. The whipped cream will hold just fine inside the refrigerator. Just tried this in two 6" cake pans (a better size for a family of three) and the recipe was perfect for filling both – so one tonight and one for the weekend! Also cut three tiers since it rose so nicely. Excellent presentation for tres leches and we love the whipped cream! Heyy, for the whipped creme/ frosting of the cake can i use an already made frosting or fruit whipped cream.?! Great recipe! It tried great. Thank you. Hey I am wanting to make this cake for a 13in round cake. How many time do I have to multiply this recipe? I'm not really sure how much of each ingredient you will need because everything would just be an approximate. The 9×2 inch round pan that I use has a capacity for about 8 cups of batter, so you will have to check to see how many cups your 13 inch round pan will hold. Based on that, you may need to double or even triple the ingredients. Hi Churchboy, "arequipe" is the name we use in Colombia for "dulce de leche", which is a type of caramel, and for this recipe is completely optional. I made this for grandmas birthday. Its soooo good it's literally the best cake we ever eaten. I made this for my mom's birthday two weeks ago, everybody loved it!!! I was not a big fun of tree leches until I made this. Thank you so much for your recipe and for making the video so easy to follow and explaining everything step by step! After 4 times trying I finally found a recipe that actually works and it's just delicious!!! Will the cake work if I use two eggs instead of four? Thanks! I have always made this cake using 4 egg whites and 4 egg yolks since it's a sponge cake. I would highly recommend using all four so you can end up with a fluffy, airy cake. I made this cake a few weeks ago, and I absolutely LOVED it!! I plan to make it again in a few days, but I want to try making it eggless, so that my parents, who are vegan, can also eat this delicious cake. Do you know what I may be able to use as an egg substitute for this cake recipe?Thanks so much!!! Hi there! Unfortunately, I have never made it with an egg substitute, especially because you will need the volume of the egg whites and egg yolks to make it spongy. Since this is a simple, basic sponge cake, you should be able to find a vegan version online. Hola grasias por tu receta mi pregunta es si quiero doblar los ingredientes para una torta mas grande cuanto tiempo lo dejaria en el horno? Hola Hector, todo depende del tamaño del molde que estés usando. Fíjate en la diferencia entre la medida del molde que tienes y el molde que usé en esta receta y ahí puedes deducir más o menos cuánto tiempo adicional necesitas. Si todavía sigues con la duda, puedes dejarlo en el horno por el mismo tiempo que indico en la receta e ir verificando cada cinco minutos hasta que ya esté listo. Hi,You did not add butter or oil in the flour. In most of the videos for Tres Leche, they add butter/oil.I just want to make sure if oil/butter is needed or not. Hi there! That is correct. I always make tres leches cakes with a sponge cake which is not made with any type of fat so that it can come out with the spongey texture. That lets the cake absorb and retain the tres leches mixture way better than a regular cake. Hello! You could but I wouldn't know what the exact measurement would be because both flours weight differently. Hello, I know this is an old post but I do have a question. The first time I made it I soaked the bottom and tried to soak the top layer however the top layer ended up being dry and the bottom layer was perfect in how soaked it was. Any advice? Hi karina, this recipe is not your typical tres leches cake where there is plenty of the tres leches mixture to soak every inch of the cake. And the reason for that is because I didn’t want it to pile up at the bottom which makes it very difficult to not only decorate but also to make it into a two layer cake. With this recipe you need to first make sure you use the same amount of ingredients I have listed so you don’t end up with two thick layers of cake. Make sure you poke it really well with the fork and pour the tres leches very slowly. You should have enough to cover both layers really well, top to bottom. The amount of tres leches mixture is plenty to give you a very moist cake but not too much so that it seeps out of the cake.